Full instructions for the step-by-step process to request admission to the Order are provided here: Application as Postulant to the Order. ORDO AETHYRIUM is Latin for ‘Order of the Aethyrs’ which can, from the Aethyrian viewpoint, also be interpreted as ‘Order of the Levels of Reality’. In ancient initiatory systems, particularly the Egyptian, initiates were often referred to as ‘Phoenixes’ and as such the Seal of the Order depicts a phoenix in hieroglyphic form as the symbol of our Inner Order and the intensifying of our work in theurgy practice. The phoenix is also often referred to as the alchemical ‘Fire Bird’ that rises from the ashes of its own calcination. It is a symbol of deep tranformation, and this accords with the Work of our Order focusing on practical alchemy as well as initiatory theurgy. 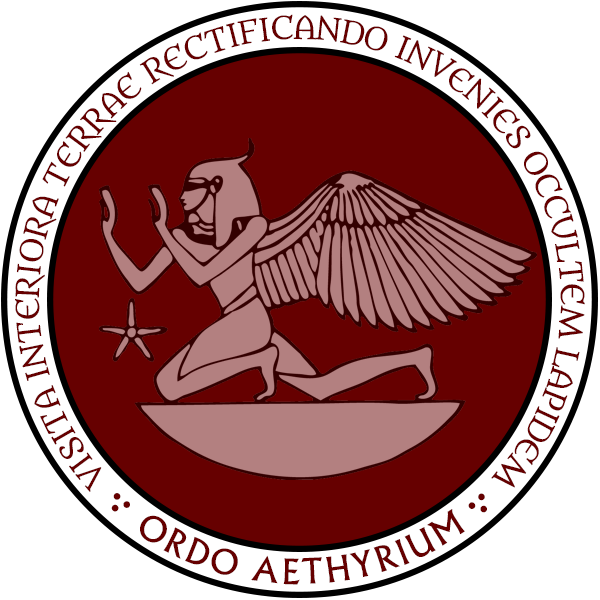 The Latin inscription circumscribing the Seal of the Order is Visita Interiora Terrae Rectificando Invenies Occultem Lapidem, also often written as its acronym, VITRIOL, and translates to ‘Visit the Interior of the Earth and through Rectification Find the Hidden Stone’. As such it is an alchemical directive that summarizes the process of the Work that must be undertaken on multiple levels through the processes of initatory theurgy and practical alchemy. The colors of the Seal are representative of the 3 alchemical Philosophical Principals: Black (Salt, Structure, Body), Red (Sulphur, Energy, Soul), and White (Mercury, Intelligence, Spirit). The Order evolved as a culmination of the work done within a small core group in conjunction with more than 25 years of initiatory adept instruction received by the founder and Overseer of the Order. Over time, as more information was shared, the official structures of the Order were put into place. The online platform for the educational arm of the Outer Order, Transcendence Works, was officially begun January 1, 2015. The purpose of this outer-level work was to offer Western esoteric initiatory teaching through practical core spiritual work, namely Illuminatory Seership and practical alchemy, coupled with theoretical introductory concepts of initiatory theurgy from the Aethyrian viewpoint of the Western Mysteries. After two years of continuous work at this educational level, three of the four streams of instruction vital to the Order had introductory online courses created with students enrolled from all over the world. During this time, the full vision, instruction, and spiritual dispensation for the creation of a cohesive working initiatory theurgical religious order was received and solidified into a proprietary codified body of unique knowledge and practices proper to the attainment of spiritual illumination through the Western Mysteries. As part of an ancient stream of understanding, we acknowledge this Work as flowing from a tributary of an ultimate and universal perennial tradition. At the end of 2016 the formal legal structure of the Order was put into place. Ordo Aethyrium was filed as an Ohio (USA) nonprofit corporation chartered as a religious order, duly file-stamped and formed on the Winter Solstice, December 21, 2016. As such, Ordo Aethyrium is recognized under 26 U.S. Code § 508(c)(1)(A) as a tax-exempt nonprofit religious entity. Member dues are paid monthly at the rate of $33 per month per adult member. As dues for membership in a religious organization, the dues are tax-deductible in the U.S. (and other jurisdictions that recognize such deductions). Proceeds from member dues as well as all revenue from donations, training courses, publications, sacraments, and seminars are received in full by the Order treasury for the operational expenses of maintaining the Order. Members will receive a contribution statement at the end of each calendar year for tax purposes with the itemization of dues and any other deductible contributions made. Ordo Aethyrium is a working initiatory theurgical religious order. While much of the initiatory work is self-paced according to each individual’s capacity to do the work according to the grade to which one is elevated, consistent and devoted practice to the best of one’s ability is expected. As far as operation and oversight of the Order itself is concerned, in addition to being supported by teaching and inner work of the Order, there should be ancillary work done in an effort to further self-supportive capacity. Activity that supports building the endowment and furthering the long-term stability of the Order without depending entirely upon member dues or donations to productively sustain its existence is paramount. In centuries past, monastic and religious orders contributed to their own support by the creation of goods traded within their communities. While we are not as an Order going to make wine or mead, cultivate bees for honey, or become soapmakers as those groups have done in the past, we do consider the creation and offering of the Sacramental Quintessences of our Order, and other relative items, to be of vital service to our community in the current age as well as an avenue to follow the productive example of those who have walked the path before us. The Chamberlain Council is composed of 5 members of the Inner Order, including the Secretariat of the Order as the Head of the Council. They are invested with specific powers as stewards of the Order in conjunction with the Overseer and fulfill a limited but important number of functions. Chamberlains meet to discuss and vote upon important business of the Order; i.e. ratifying amendments to the Regulations of the Order and issues that involve contracts which must be approved by the Council. In matters of succession to the position of Overseer, the Council is required to ratify the succession as a check and balance to the security and longevity of the Order. While the founding Overseer has full authority over all curriculum and religious matters, the Chamberlains are also called upon in an ad hoc advisory capacity regarding projects of the Order. The official sacraments of the Order are alchemical quintessences. In particular but not excluding other alchemical preparations, these are the Sacramental Quintessences produced through our Primum Ens process. In particular, the Prima Entia of Melissa (Melissa officinalis), White Oak (Quercus alba), Blue Spruce (Picea pungens), and Immortelle (Helichrysum italicum) are considered primary sacraments from the plant kingdom. Other alchemical preparations from the mineral realm used in advanced levels of Inner Order training are considered as a secondary, and higher level, of our sacramental hierarchy. Aethyrian sacerdotal training is the core of the 10° Templaris training. All those in the Inner Order who are eligible to take this elevation have mastered each of the initiatory practices used in sacerdotal training; however, only those who wish to rise to the responsibility of overseeing a temple, and administering Aethyrian Mass and Sacerdotal Rites undertake this level of training as an Officiant of the Order. Completing this officiant level of training invests a member of the Order into the official clergy of the Order. Within the factions of the Western esotericism community with initatory focus on practices related to theurgy, there is wide debate over the nature of the achievement of what is commonly referred to as ‘Knowledge & Conversation of the Holy Guardian Angel’ and whether or not that entity regarded as one’s Holy Guardian Angel (HGA) is identical to the intelligence referred to in the Western Mysteries as one’s Higher Genius (HG). Some take the position that they are the same. Others assert they are two distinctly different things. Still others that see the HGA as an extended ray of the HG that allows initiates to have direct experience of it in the interim between achieving ‘Knowledge & Conversation’ and the full merging with the HG as a state of full Illumination. As one who has experienced both Knowledge & Conversation, as well as the vision of the HGA through Illuminatory Seership, the Overseer of the Order concurs with the third conclusion: That the HGA is a extended ray of the HG, and that is the official position of the Order on the nature of this aspect of initiatory theurgy practice. These polarized arguments over evolution versus creationism, and by extension, intelligent design, are, from the perspective of an initiate of the Mysteries, the result of holding belief positions of mutually inadequate context (understanding). Within the Mysteries, it has long been held that before there can be evolution, there must first be involution. That before things come into physical manifestation within the crucible that allows evolution to occur, there must be a nonphysical state of being that holds the rules of how each thing is to function. These ‘rules’ are inherent within the involution process and necessary for the orderly functioning of all things on all levels. That these ‘rules’ exist is not in debate. However, these two diametrically opposed modern viewpoints which assert that any validation of one is the concurrent dismissal of the other, requiring vehement attacks from one side on the other, is short-sighted on both sides of the debate. Though the Ancients did not have the deeply technical information available in their time as we have now, the Mysteries have not only always acknowledged evolution as possible… but consciously engaging in its acceleration has always been the primary impetus behind the totality of Mystery training in the first place. Training in the Mysteries is about accelerating the capacity to evolve into the next level of being that all humans have the embryonic capacity to become because we were designed to be able to learn to consciously evolve into the next level of being… though this impulse is obviously slower in some more than others. The impetus to continue our expression as a species on an evolutionary track is the fulfillment of an inherent energetic and intelligent pattern placed within all things during the nonphysical side of the creation process (involution). The view of the Mysteries on this matter is overarching and in accordance with The Emerald Tablet, transcends polarized positions: Evolution occurs as a function within physical existence (The One Thing) according to a blueprint of intelligent design (The One Mind). What kind of instruction or spiritual training do you offer for minors? Minors within families of Order members are eligible to learn Aethyrian Ascension, a structured form of meditative prayer made available to the Outer Order. Since Ordo Aethyrium is a religious order based upon the initiatory teachings of the Western Mysteries, which does not advocate solicitation, any instruction of a minor must be requested by the minor due to a mature interest in the teachings of the Order. Acceptance to such instruction will be based upon mutual approval of at least one of the minor’s parents or legal guardians, and an authorized representative of the Order.